A photo mosaic that engages and makes a memorable moment. So imagine I am a guest at your event and I see this really cool photo mosaic wall, I walk up and want to contribute, but I am told that I am not allowed to help build it, and to come back later and my photo might be on the mosaic. A real bummer right? And moreover, a missed opportunity to engage and make a memorable moment. What is so special about our system? 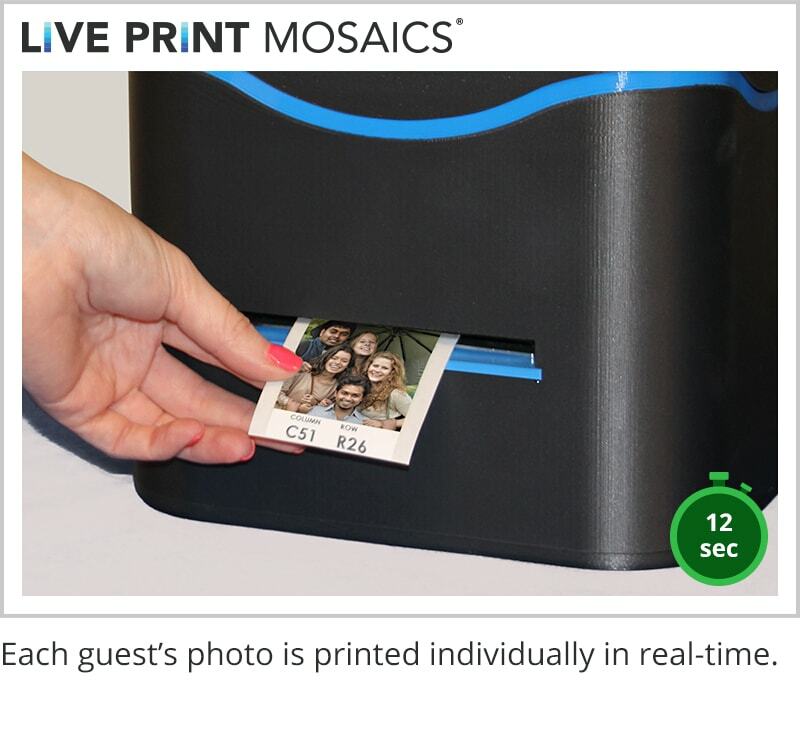 Answer: Guests get to place their own photo! In this short post, we will look at the big 3 reasons why our Live Print Mosaic system is the only solution in the world that offers the ability for guests to actually place their own photo. Reason 1) Large Coordinates are a MUST: Our patent-pending segment adhesive photo is broken into three parts: A header, the main photo, and the coordinates. We print the coordinates as large as possible in a bottom segment so they can be seen by anyone, young, old, and in all lighting conditions. For completeness, we also place the coordinates small in the lower corner. 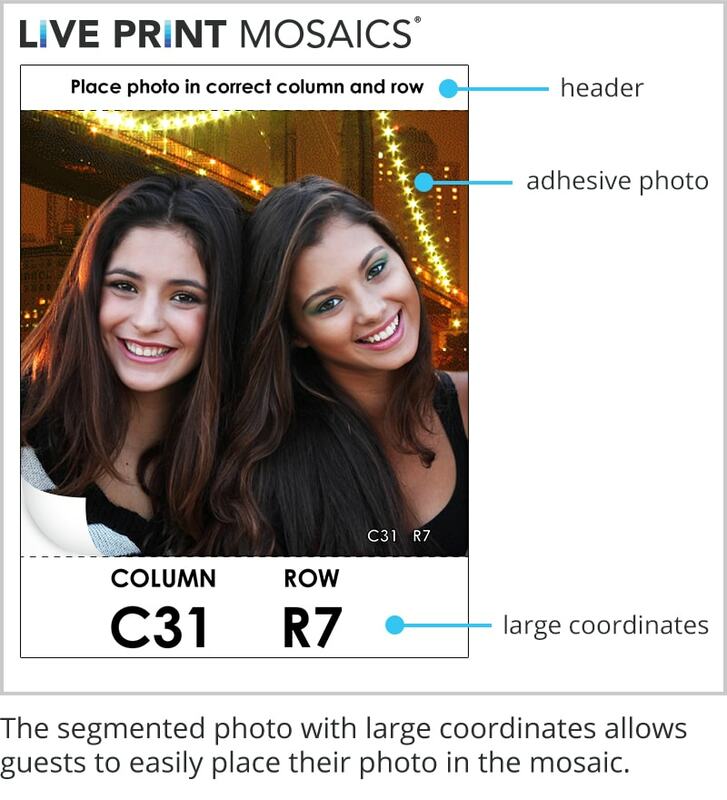 Reason 2) True vs Fake: Last, but certainly not least, be sure to be aware of photo mosaic systems that simply superimpose or ghost the main image on top of the photos. So far all other systems we have seen take this fake approach. Who wants to place a photo with a line running through their face anyway? Our goal is to always create the truest mosaic possible. See the below animation to better understand true mosaics vs. fake mosaics. Reason 3) Real-time Printing vs. Batch Printing: Every other commercially available system out there does not print the guest’s photo out in real-time. 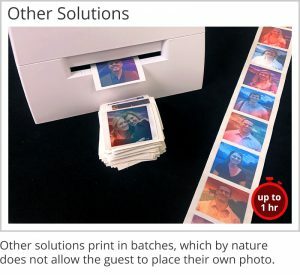 Instead they are printed in batches, which by nature does not allow the guest to place their own photo. Whether printed as a long strip or individually every few minutes or every hour, batch printing seems like a huge failure and missed opportunity for great engagement.